Holy smokes, I can’t believe it’s August already! Life is a little crazy right now. We have the Big (-ish) Move on Saturday to prepare for and our house is a disaster. I can’t figure out what I want to bring down to Madison and what I want to leave in Appleton. I have a new job starting on Monday. Don’t get me wrong – my life is hectic, but I love it. After speaking with a friend recently, I realized just how blessed I am. I got into a dietetic internship on my first try. I passed my RD exam the first time I attempted it. I landed a job right away. And now? Now I’m moving on to an even better job. Best of all, I have the most amazing and supportive husband next to me. I have so much to be thankful for. I haven’t been cooking much because we have very little food in the house and I don’t want to buy more before the move. Stupid me didn’t prepare for this move very well. If I had any sense, I would have stockpiled some posts and scheduled them for the next few weeks. Instead, I have nothing. So DSD might be a little empty for a couple weeks while I rebuild my life in Madison. I plan on stocking up on more unsweetened chocolate soon because I need to make more of these. I have even heard that these are perfect for freezing individually and then microwaving for 15 seconds later on for a magnificent, fudgy treat. Preheat oven to 350°F. Line an 8×8 metal pan with foil, draping foil over the edges. Generously butter the foil. In a large saucepan over low heat, melt the butter and unsweetened chocolate, whisking occasionally, until completely melted. Remove pan from heat and whisk in cocoa powder until smooth. One at a time, whisk in sugar, brown sugar, eggs, vanilla, and flour, mixing well after each addition. Pour batter into prepared pan. Sprinkle salt on top and gently swirl into batter using a toothpick. Bake in preheated oven for 30 – 35 minutes, or until edges are done but center is still slightly gooey. A toothpick inserted into the center should come out with a little batter. 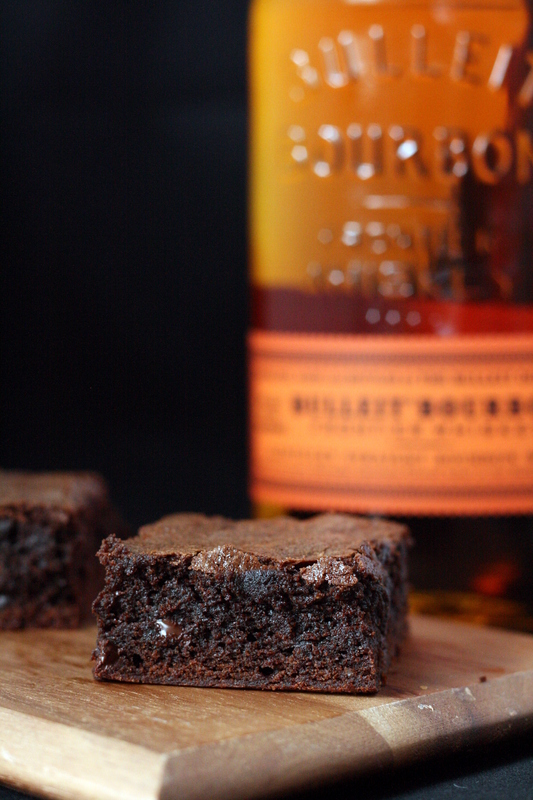 Let brownies cool for 1 hour at room temperature. Place in refrigerator and chill for 1 more hour. 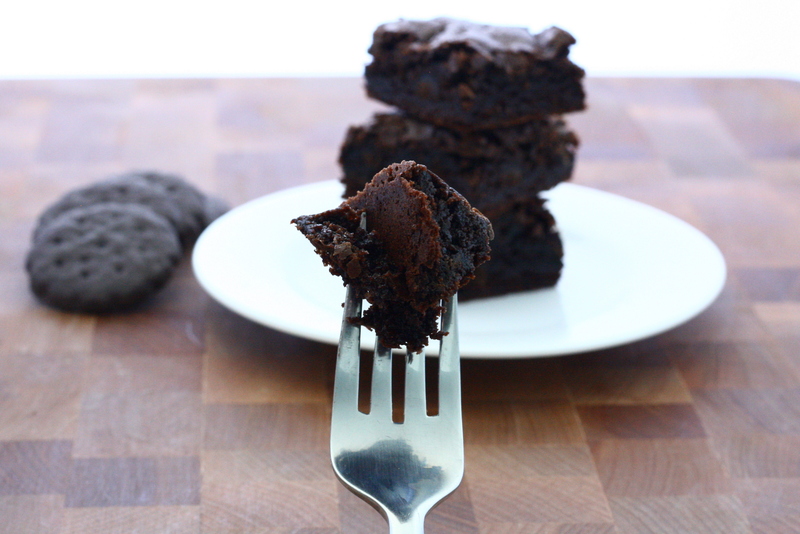 Life brownies from pan by grasping the foil overhang and place on a cutting board. Cut into 16 squares. Serve at room temperature. Categories: Brownies, Chocolate, Dessert | Tags: brownies, chocolate, dessert, quick and easy | Permalink. 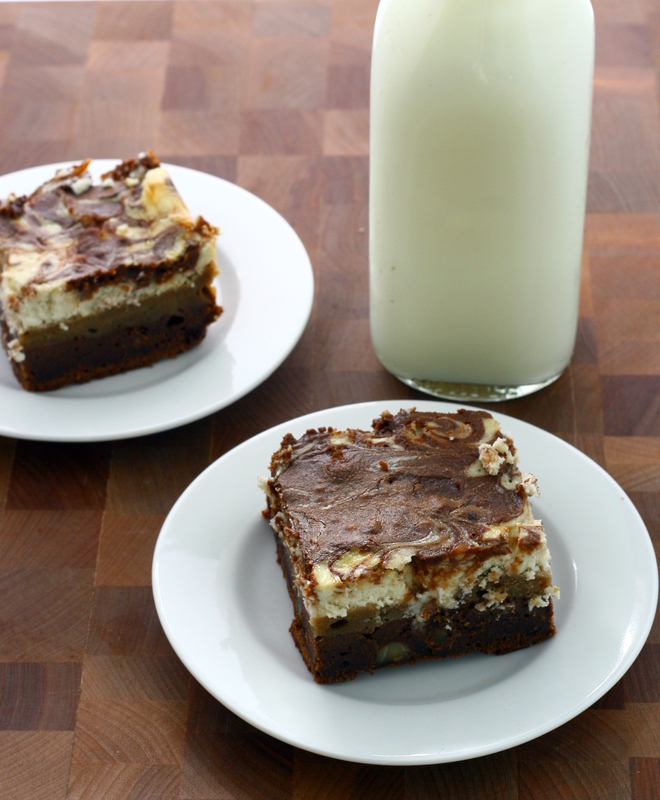 When Jessica over at My Baking Heart posted these tiramisu brownies, I knew I had to make them. Immediately. Usually I find a recipe that calls out to me and put it on my “to do” list. These babies almost skipped every other dish I had on my list and I made them as soon as I could. Preheat oven to 350°F. Butter and flour a 13×9 baking pan and set aside. Place chocolate chips in a large microwavable bowl and microwave in 30 second intervals until smooth and melted, stirring after each time. Let cool slightly. Pour melted chocolate into a mixing bowl fitted with the paddle attachment. Beat in butter on medium speed until well incorporated. Add in 1 cup of sugar, 4 whole eggs, and 4 egg whites, mixing until well blended. Mix in flour and instant coffee on low speed until just combined. Carefully fold in hazelnuts. Remove 1 cup of batter and pour remaining batter into prepared pan. Place lady fingers rounded-side down on top of the batter, pushing down slightly on each one. Combine coffee with rum and brush onto the ladyfingers until saturated. In a separate bowl, combine mascarpone cheese, Neufchatel cheese, 1/4 cup sugar, 4 remaining egg whites, and vanilla extract. Carefully spread over the ladyfingers. 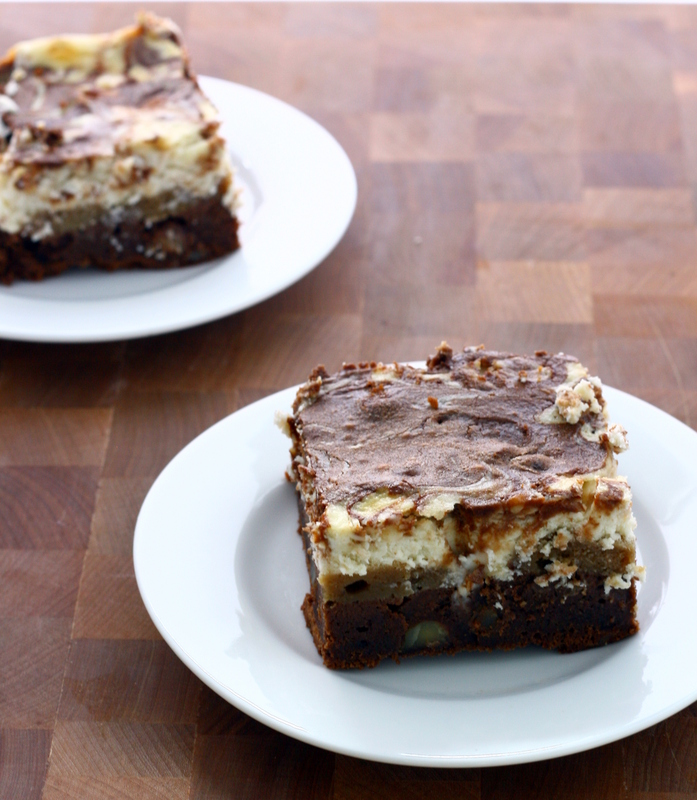 Drop dollops of remaining brownie batter on top of the cheese layer and swirl gently with a knife. Bake for 45 – 50 minutes, or until brownies begin to pull away from the sides of the pan and the center is almost set. Let cool completely in pan before cutting. Categories: Brownies, Chocolate, Dessert | Tags: brownies, cheese, chocolate, dessert | Permalink. Girl Scout Cookie Season is one of my favorite times of the year. This year, I bought 7 boxes of cookies. Three boxes of Peanut Butter Patties (for Mike), one of Caramel DeLites, one of Mango Cremes, one Lemonades, and one box of Thin Mints. One. Thin. Mint. What was I thinking?! Why in the world did I only get one box of my favorite cookie? That brings me to this week’s recipe swap. It was blogger’s choice, so I got to choose a recipe of my liking from Cookies on Friday. I combed through every single one of her posts going all the way back to 2008. I bookmarked a bunch of recipes and settled on making these triple ginger cookies. Then, she posted Thin Mint Brownies. And I knew in my heart that I had to make them. Even though I wanted to cry at the thought of sacrificing one precious sleeve of my single box of Thin Mints. But, this was so worth it. 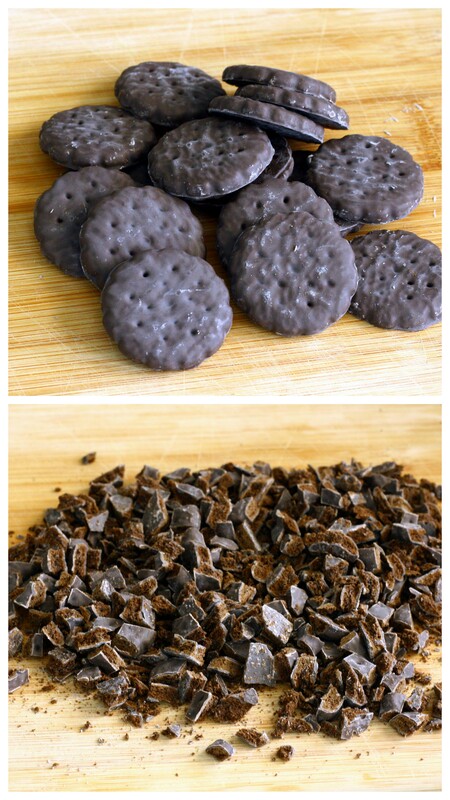 If I had a whole sleeve of Thin Mints left, I would make a second batch. But the second sleeve is residing happily in my stomach now. RIP. Preheat oven to 350 degrees. Line a 9” x 13” pan with parchment paper and set aside. In a large mixer bowl, blend the cocoa powders, baking soda, boiling water and the first 1/3 cup of oil. Stir on low until blended. Add the sugar, eggs and remaining 1/3 cup oil, stirring again on low until blended. Finally, add the flour, vanilla, mint extract and salt. Stir until just combined. With a spatula, stir in the chopped Thin Mints. Spread into the prepared pan and smooth the top. Bake for 35-40 minutes. Allow to cool completely in pan. 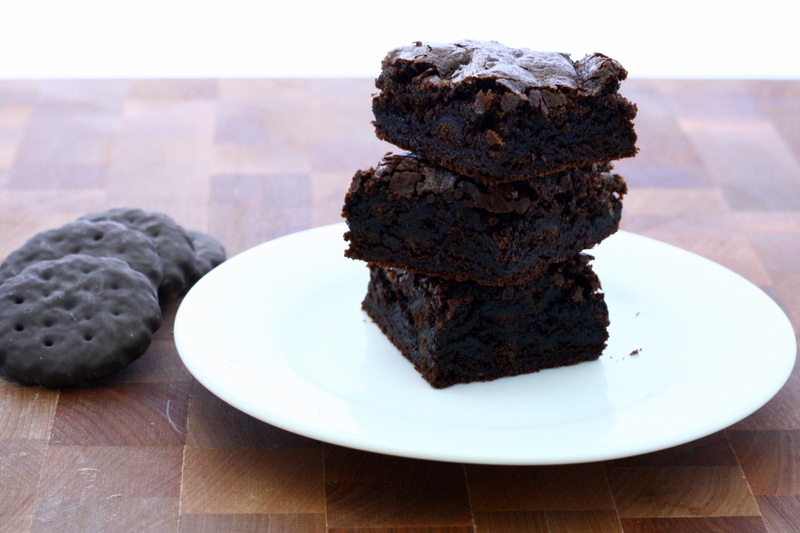 Remove the brownies from the pan by lifting the parchment paper. Peel away the parchment paper and cut into bars. Be sure to head on over to Taste of Home Cooking to check out the recipe swap round-up! Categories: Brownies, Chocolate, Dessert | Tags: brownies, chocolate, dessert | Permalink. Folks, I’ve found my all-time favorite brownie. And they’re made with zucchini. 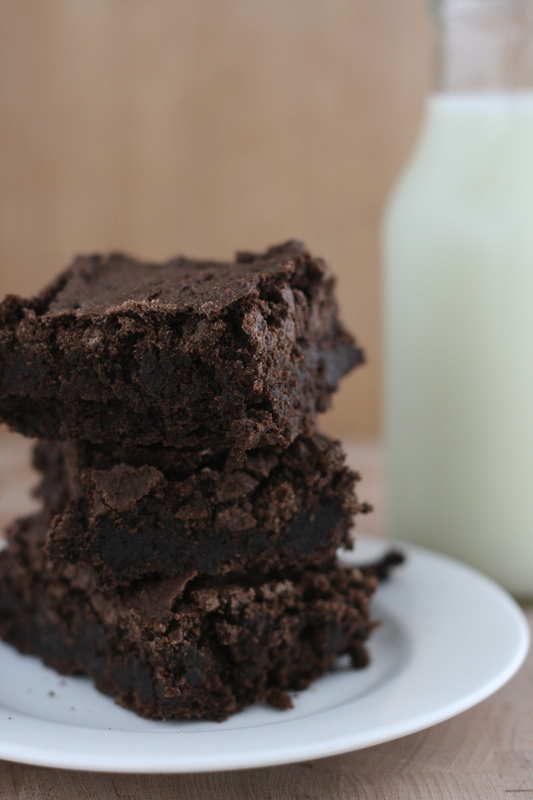 It may sound gross at first, but trust me… this is one fantastic brownie. Part of me wishes I hadn’t ever made these, because now I can’t stop eating them, making them, or thinking about them. 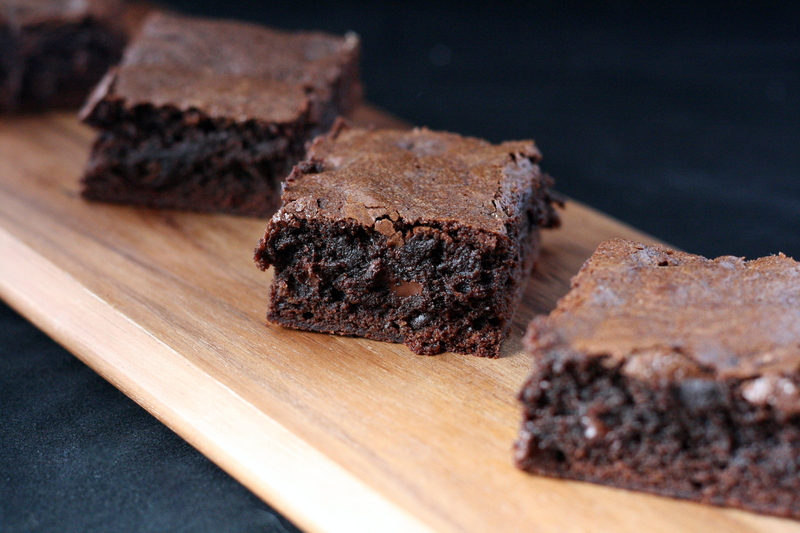 Still not convinced that these are rock-star brownies? Well, remember this – I really don’t like chocolate. Or desserts. So, the fact that I like love these should be reason enough for you to grab some zukes and get bakin’! Preheat oven to 350°F. 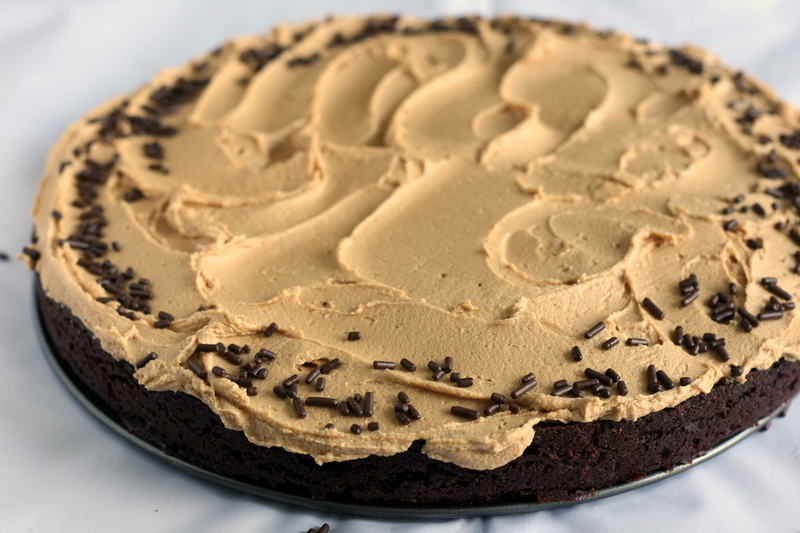 Grease a 9×13 inch baking pan with butter and dust with cocoa powder. In large bowl, mix together applesauce, sugar, and vanilla until well combined. In a separate bowl, whisk together flour, cocoa, baking soda and salt. Gently stir into the sugar mixture. 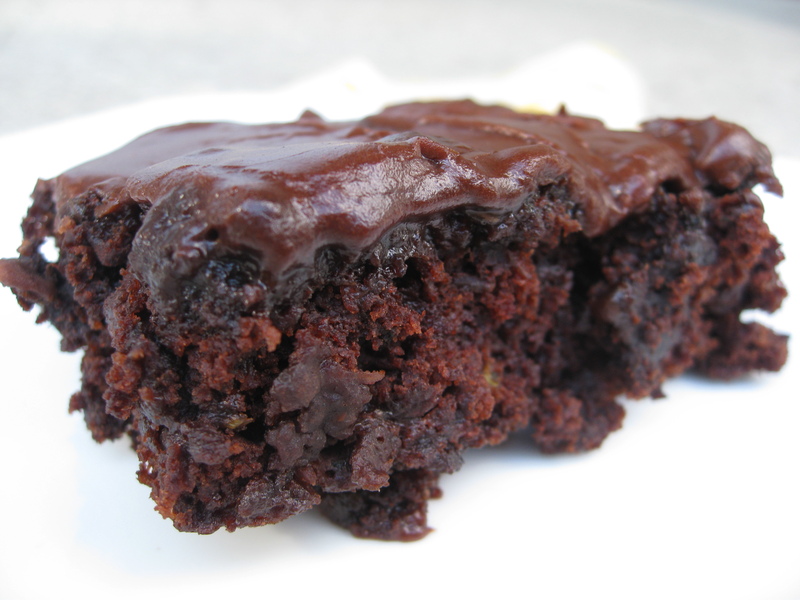 Fold in zucchini and chocolate chips or walnuts, if desired. Spread batter evenly into baking pan. Be warned – the batter at this stage is very hard and crumbly and not batter-like at all. Bake for 30 minutes, or until brownies spring back when touched. Set pan aside to cool. 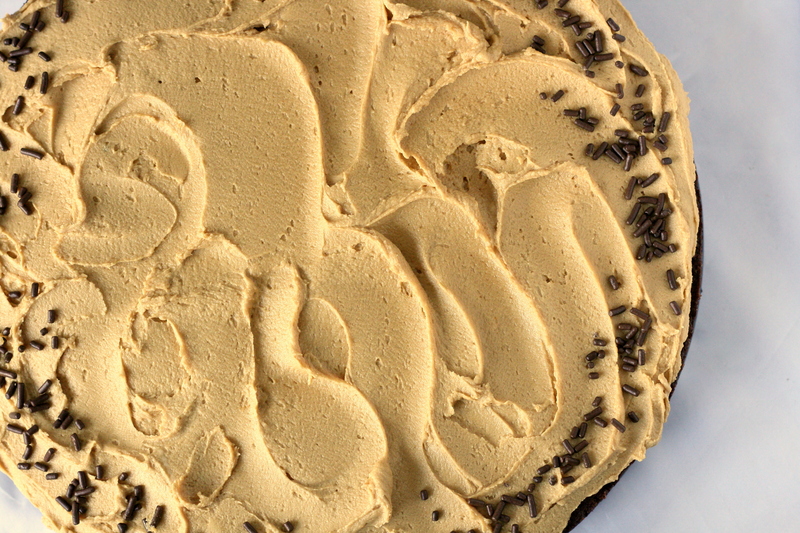 To make frosting, microwave butter and cocoa until melted. Stir to combine and set aside to cool. In large bowl, mix together powdered sugar, milk and vanilla. Mix in cocoa mixture until frosting is smooth. 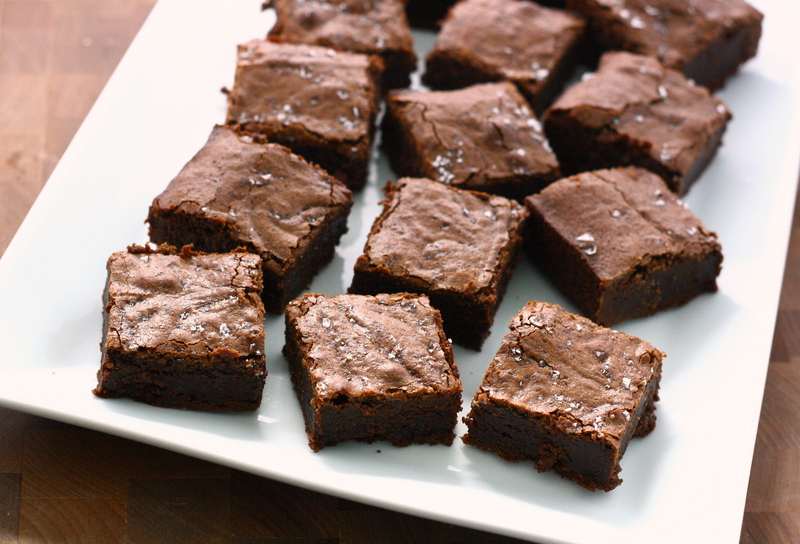 Spread frosting over cooled brownies and cut into squares.